Once I realized that Passover didn’t have to be Maxwell House hagaddah-driven (how many more pages until we can eat something? ), with chewy brisket, weird-textured dessert, and macaroons from a can, I started to look forward to it. Now it’s one of my favorite holidays, and we’ve established a tradition of celebrating with a lovely group of friends. I’m going to describe the dessert first, because we all wanted to have the dessert first once we saw what it was. 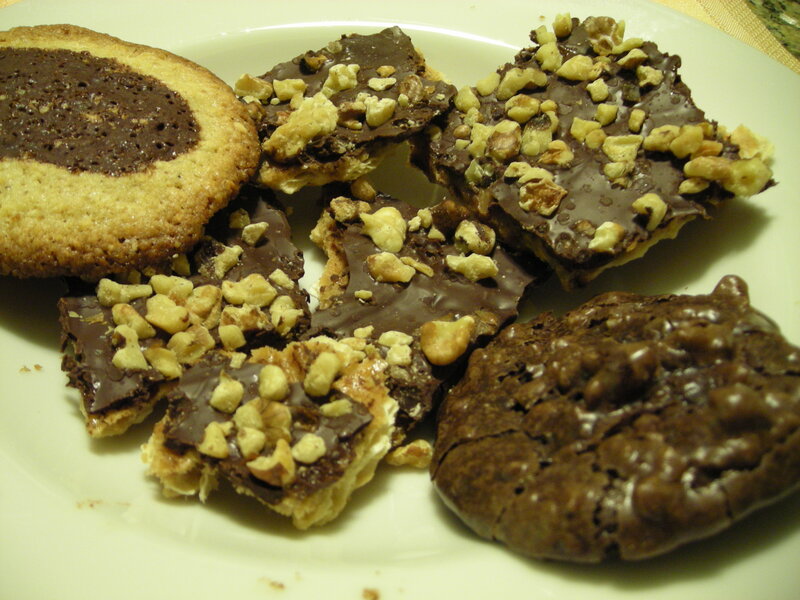 My lovely baker friend made Smitten Kitchen’s hazelnut chocolate thumbprint cookies and chocolate caramel crack, and Payard’s flourless chocolate walnut cookies. One guest told a not entirely convincing story about a tribe in his homeland who starts the seder by having dessert. We all wanted to believe him, especially when we saw the chocolate caramel crack, which is caramel-covered matzoh coated with chocolate and walnuts. It was, hands-down, the best Passover desert I’ve had. This haroset recipe is inspired by one of Joan Nathan’s. It’s so good, and every year my husband asks why we only have it on Passover. The cardamom and black pepper give it an unexpected kick and heighten the sweetness of the fruit. Making this was the first time I “got” cardamom, and after that I wanted to put it in everything. Caution: you can overdo the cardamom, so if you want to jack it up a bit, do it in small increments. 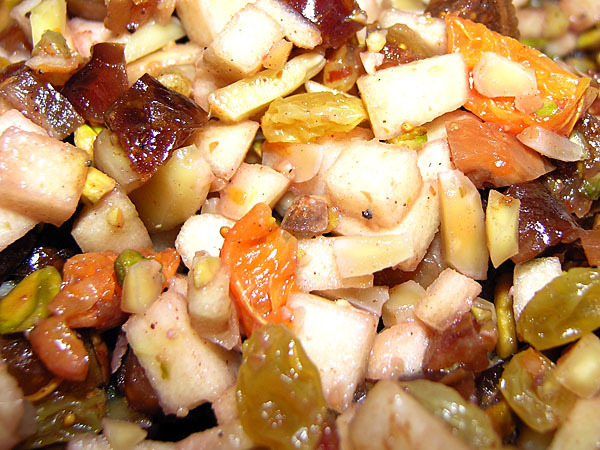 Combine fruit, nuts, and spices. Add the wine and vinegar and stir. Taste, and add more wine or spices to taste. This can be made earlier in the day and refrigerated. Bring to room temperature and remix it before serving. 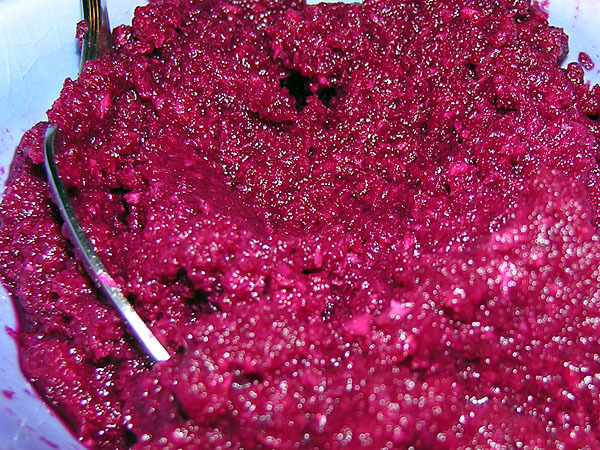 Horseradish: When a friend offered to bring prepared horseradish made from fresh horseradish, I was excited. Then he said that when his dad was grating it, its potency made his dad yell and anyone entering the kitchen was immediately in tears. Was it going to knock us out before we even got to the dinner? Or wipe out our ability to taste anything else? Fortunately, it mellowed. It was still extremely pungent and a bit of a punch in the face, but in a good kind of way. Muhammara: I’ve made many variations of Muhammara, and I like the one in Claudia Roden’s The Book of Jewish Food the best. I modified it to replace the whole wheat bread it calls for. I often serve this as an appetizer with pita chips. Combine all ingredients in the food processor, pulsing until well blended and creamy. Adjust salt and pepper to taste. Can be made a day in advance and refrigerated. Bring to room temperature before serving. Garnish with parsley sprigs. 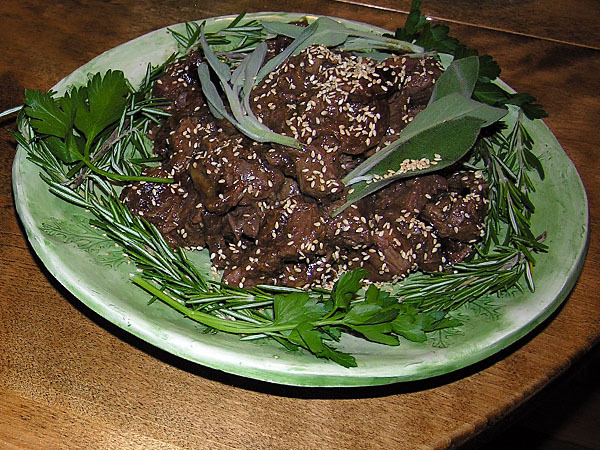 Lamb with dates: I looked through all of the lamb dishes in The Book of Jewish Food by Claudia Roden before I decided to make this recipe with dates, which is a variation on a lamb with prunes dish. The recipe is basically a lamb stew with Moroccan spices (saffron, ginger, nutmeg, and cinnamon) and soft caramelly dates. 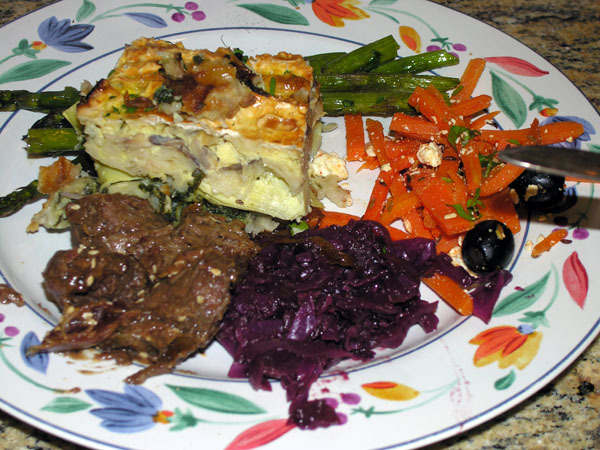 This dish is hard to mess up, and a good one for dinners when you are not exactly sure when you will be serving the main meal. 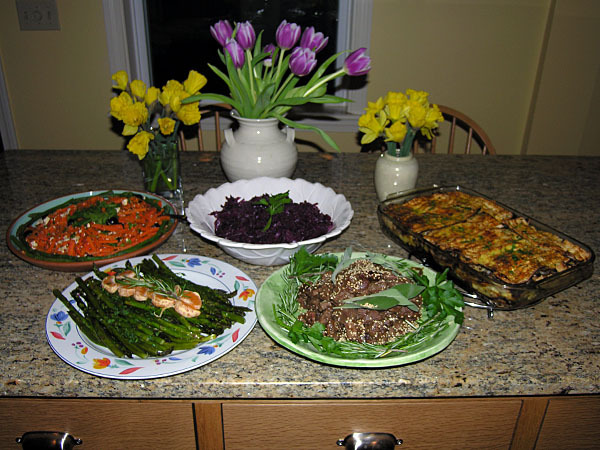 For the side dishes, my selections were based on what would taste good with the lamb, be colorful, and be somewhat seasonal (grown somewhere in North America). 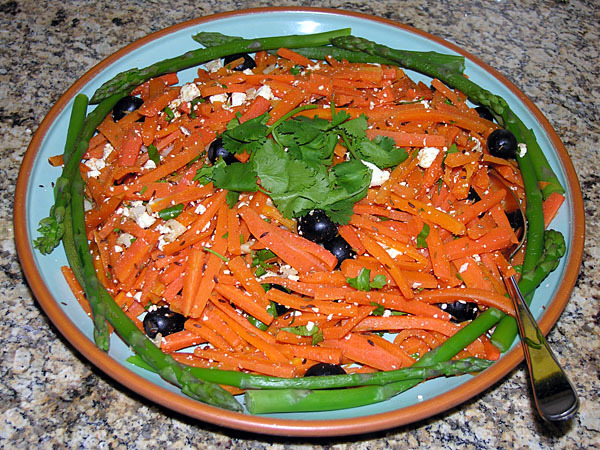 My should-be-a-food-stylist friend brought a spicy Tunisian carrot dish, which was boldly spicy and a nice companion to the rich lamb. 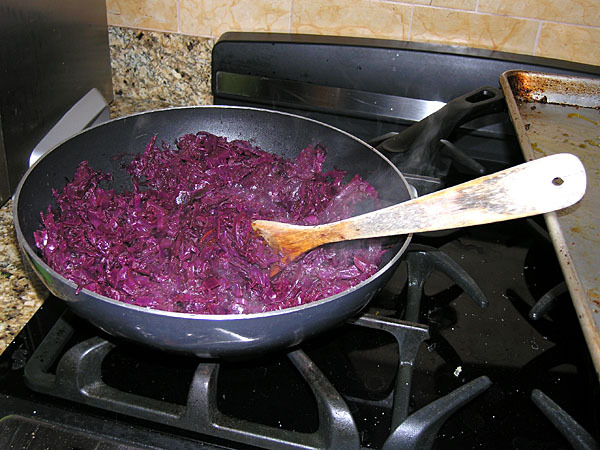 The braised red cabbage with apples recipe came from the New York Times, and I made it a day in advance because the recipe said it would be better that way. Roasted asparagus: The roasted asparagus recipe is adapted from one on epicurious. Preheat oven to 450 degrees. 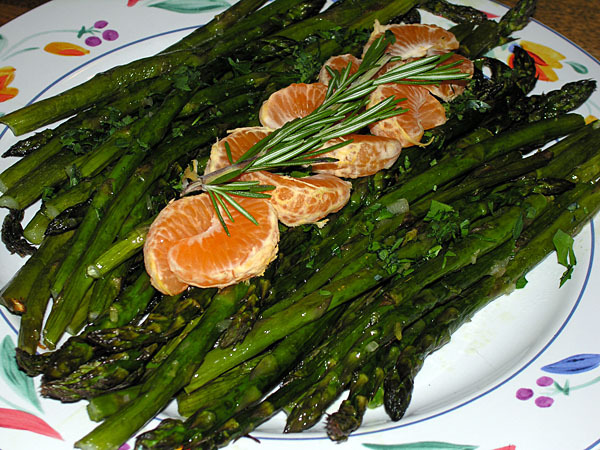 Combine olive oil, shallot, lemon peel, lemon juice, and salt, and then toss with asparagus on rimmed baking sheet. Bake for 12-15 minutes, tossing asparagus a couple times while baking. Serve warm or at room temperature. Ask should-be-a-food-stylist friend to garnish it. Roman vegetable and matzoh “lasagne”: This dish is adapted from a Joan Nathan recipe that lives somewhere deep in the archives of the New York Times. I make it every year. On first read, you might think it’s a lot of work, but it goes quickly and you can do other things while some of the vegetables are sauteeing. When I first read the recipe, I was skeptical–layering matzoh with other foods brought me back to Sunday School and the “cake” we made with alternating layers of matzoh and canned chocolate frosting. I got over that and actually thought the matzoh made a light layering base. 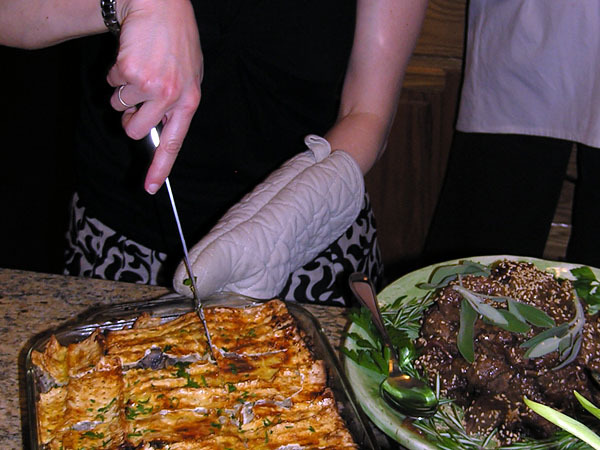 This dish was well liked, and if you need to bring a dish to a friend’s seder, this travels well and is quite popular. I added cannelini beans to make it more hearty, but they are optional. 1. Preheat oven to 450 degrees. Lightly grease a 9 x 13 baking dish, and set aside. 2. Heat a large skillet (preferably not nonstick) over medium heat. Add 3 TBS olive oil, and then add the onions and toss to coat. Add a couple pinches of salt. Caramelize the onions, stirring and scraping the bottom of the pan every few minutes until onions turn a golden brown, about 20 minutes. If onions start burning, lower the heat. (Onions can be made a day in advance). Put the onions on the bottom layer of the prepared baking dish. 3. In a large nonstick skillet, heat 1 TBS olive oil over medium heat, and saute 2 garlic cloves’ worth of the minced garlic for a minute. Add the artichoke hearts, rosemary, sage, and salt and pepper to taste, and saute until softened, about 5-10 minutes. Stir in 1 TBS lemon juice. Put the artichokes in a small bowl and set aside. Using the same pan on medium heat, add 1 tsp of olive oil, and 2 cloves worth of the minced garlic. Cook for 1 minute, then add the spinach, and keep stirring as the spinach wilts. When the spinach is wilted and cooked, add pinch of crushed red pepper flakes and salt to taste, and stir in the cannelini beans. Transfer the spinach and beans into a small bowl. 4. Wipe out the nonstick skillet. Heat 2 tsp olive oil on medium high heat, add the remaining minced garlic and saute for 1 minute. Add herbs de Provence and the mushrooms. Cook until mushroom start to soften, about 5-8 minutes. Remove from the heat and add salt and pepper to taste. 5. Now you are ready to assemble the dish. Fill a large bowl or baking dish (I used a 9×9 Pyrex baking dish) with water. Put 6 pieces of matzoh in the water, and carefully turn the stack so all pieces get wet. When they are moist and almost crumbling, put two matzohs over the onions in the baking dish, and break a third matzoh to cover the rest of the onions. It’s OK if the matzohs start to crumble. You just want to put down a layer of matzoh, even if it’s in crumbly pieces. Add the spinach and artichokes for the next layer, and cover with a layer of matzohs. Put the remaining 3 pieces of matzoh into the water. 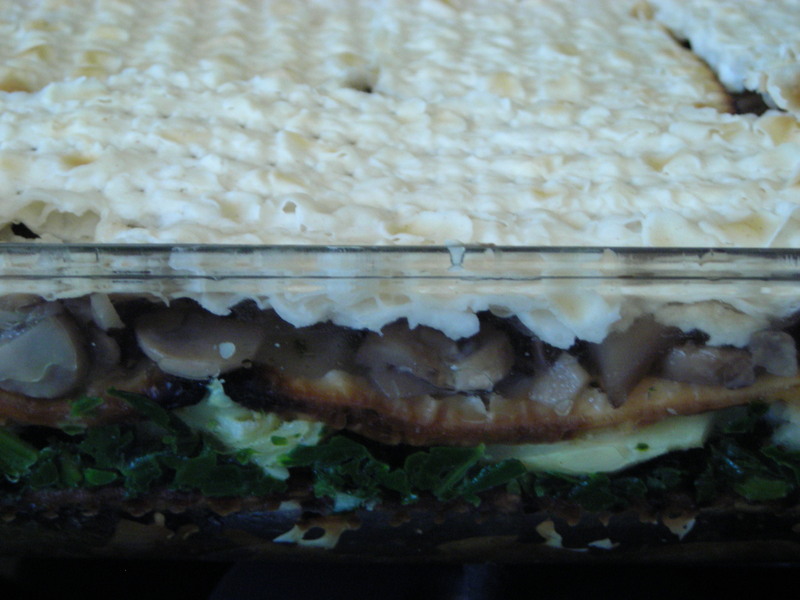 Put the mushrooms on the next layer, and then cover with the last layer of matzohs. 6. Pour the vegetable broth over the dish. Pour the beatened eggs and remaining lemon juice over the dish. Bake for about 30 minutes. Sprinkle minced parsley over the top and serve warm. This entry was posted in Holidays, Middle Eastern and tagged Passover by Amy. Bookmark the permalink. Yum, and more yum. Leftovers were equally great, and the horseradish mellowed (we have been spreading it on everything). Amy, Jon forwarded your link to me and I was so happy to check it out. And now I am extremely hungry. And also bummed out that I’m off sweets for April. Thanks! So sorry to hear you are off sweets this month. At least the month is almost half over!